Ah, yes, fall. Sweaters at the ready, school busses on the roads, pigs flying¹, and an early frost is on the pumpkin. Okay, the pumpkin part is merely poetic license. It’s 75 degrees outside right now as I sit here typing. Still, it’s fall here in Florida. The leaves on some of the trees have indeed turned color, and we’ve had a handful of cold mornings already with temperatures in the 50’s. Yes, 50’s! If I wiggle the antenna just a smidgen, I can hear violins of sympathy playing in northern states. All the same, we are experiencing weather changes here in St. Augustine that are a contrast to what we had when we lived in Vero Beach. I preferred the weather down there because it was pretty steady: it was hot and sunny in the spring, followed by hotter and sunny in the summer, and then returning back to hot and sunny for the rest of the year. For someone whose sole aim in life is for consistency and repetition, Vero Beach was a place of true nirvana for me. However, my lovely wife found it all to be monotonous. She missed — bless her — the changes in the seasons. So in the spirit of true compromise, I moved us a whole two and a half hours to the north. Who says I’m not accommodating? All during this recent month of September, Gorgeous complained how hot it is here. I kept responding that we’re living further north now, and just as the song goes, a change is going to come. She would look at me warily and mumble something I couldn’t quite make out but which seemed to question my understanding of the gluteus maximus region vs. the elbow. Sure enough, one hurricane and just a couple flips of the calendar later the weather did indeed change. Twice this week she’s complained about how cold she is. For G-d sakes, is there no way to make this woman happy?! However, after getting a series of text messages from her sister in Michigan, who offered horrid tales of 38 degree temperatures there this morning (Hi, A), Gorgeous backed away from the earlier remonstrations of doubt and disapproval about where we live. Northern Florida suddenly agrees with her. I even got a “thank you for bringing me here” squeeze during a visit to a beachside farmer’s market today. Score! Note to self: don’t gloat. But the calendar isn’t just preoccupied with the change in the season. No, a quick glance at the one on my phone the other day reminded me of both a milestone coming up and some medical procedures. Leave it to Apple to make it all seem so happy, though. So medically speaking the autumn isn’t exactly turning out to be a hay ride over at the farm. In addition to the joy of an upcoming colonoscopy, recent lab and C-T scans show what appears to be a six millimeter kidney stone, plus two additional ones that my new urologist charitably describes as “minor players.” I’m not sure if he was making allusions to film actors or organized crime figures, but it might be fun to be referred to as “Mr. Six” for the next few weeks. I won’t reveal the true measurements if you don’t. Of course, I could do without any of this happening. I haven’t had a kidney stone in four years, and I was hoping that maybe I could get to at least a decade before it happened again. Most of my previous stones have happened around times of stress or turbulence in my life. I suppose buying a new home and moving probably falls into that category. Even good stress is still, well, stress. And while all of this is going on, November is also the time when we here in the United States consider our options during what’s called “Open Season” for health insurance coverage. Most of us have approximately four weeks to switch plans or stay in the same one. For the third year in a row I am again making a change. Fortunately I’ve already done my homework to see if all of our new doctors are part of the plan I’m switching us to, and I’ll double-check once more just before making the official switch. I suspect my current insurance will be happy to see me go, what with my hernia repair earlier this year and now these two upcoming procedures. I can’t say I didn’t get my money’s worth. Autumn is when we can remind ourselves that the falling leaves mirror the changes in our own lives. It’s a time for letting go and releasing those things that have become a burden. For me that apparently would be a kidney stone, but for you hopefully it’s just a garden hose that you’ve been patching up with tape since July. Whatever it may be, embrace the change and enjoy the harvest of the season. ¹ I am actually referring to the flying pigskin of the gridiron. But feel free to conjure up your own variation — there’s a lot of low-hanging fruit being offered lately. Most of my health tests happen in spring. It moderates the joy of the season change! Glad that you are enjoying the weather changes, modest though they are. Good luck with that colonoscopy. No envy here. I think all of our tests are happening now because of new doctors. But I’m grateful, otherwise I’d have not known about the stone until it was too late. My niece and all of her kids get them. Hope they can treat before they get to the “I’m gonna die” stage. Gorgeous’ sister must work at Koehl’s in Palm Desert. Richard and I stopped by there this afternoon and the cashier was complaining how cold it was today. It was 79 degrees F. Richard and I were sweating! Ha, Donna. Ah, yes, that individual perspective. 79 degrees is that perfect temperature! She’s lately been thinking of moving down here, though I suspect it’s probably too drastic of a change for her. I wore a coat tonight for the first time since last winter. I don’t think I really needed it but I wanted to embrace the season (such as it is in Southern California). May your colonoscopy be smooth sailing and your kidney stones teeny tiny. Enjoy your autumn, the snowbirds will be congregating soon. Ah, the evening coat in southern California. It becomes more about fashion, but who wouldn’t want that?! I think the snowbirds will migrate primarily to the south of here because it’s too cool up this way. But we’ll find out soon. It snowed for Hallowe-en up here. We are two latitudes north of the border. Well, it’s all a matter of perspective I suppose. I’d fancy myself an old west gunslinger with my six-shooter. Even though I hate guns. Looks cold Marty. It’s been cold here too. It was freezing today . Silly me went out with sandals a slip on dress and a fleecy and was still cold. If you change insurance don’t they look at all your existing disease state? The pool of insurance providers from which I can choose are not allowed to bar anyone because of a pre-existing condition. That’s a right the Congress is currently trying to remove on behalf of the health insurance industry, but for now it remains. So I am allowed to switch and not worry about that. Later when I’m covered by Medicare it’ll hopefully not be an issue then either, but these are scary days here with our president cozying up to business rather than citizens. I love my sandals very comfy. In Summer or heat my feet swells . Which reminds me need to go wear my new pair in. That’s good to know . I’ve only been with one mob. The subscription just goes up and up. At least they pay when you claim and I can go anywhere I want with regard to doctors and dentists etc. some over here advise you go to certain hospital ..
Hubby is complaining, daily, about the lack of autumn here. We went from 80 degree summer days to 40 degree winter days. Even I can say hum-bug to that! I love fall weather and we had about 2 days of it. So the 75 degree in Florida is a siren’s call to both of us right now. Here’s hoping you continue to have that ideal weather… until the hotter days of summer start back up. How was that deep fried Oreo, BTW? Long time residents of our county (St Johns) joke about the “one month” of winter here where temps do dip. But in the main, while certainly cooler than environs to the south, I think we’ll still highs in the 70’s through December and January. I loved the weather in Vero Beach, but there’s way more to do here. I lived in Florida for 18 years and I HATED it! 198,000 degrees every single day! All I ever asked for was a nip in the air on Christmas. Shoot! I lived in Florida for 18 years and never experienced a hurricane. I wanted to see one! The year after I left, I think they had three or four back to back to back. 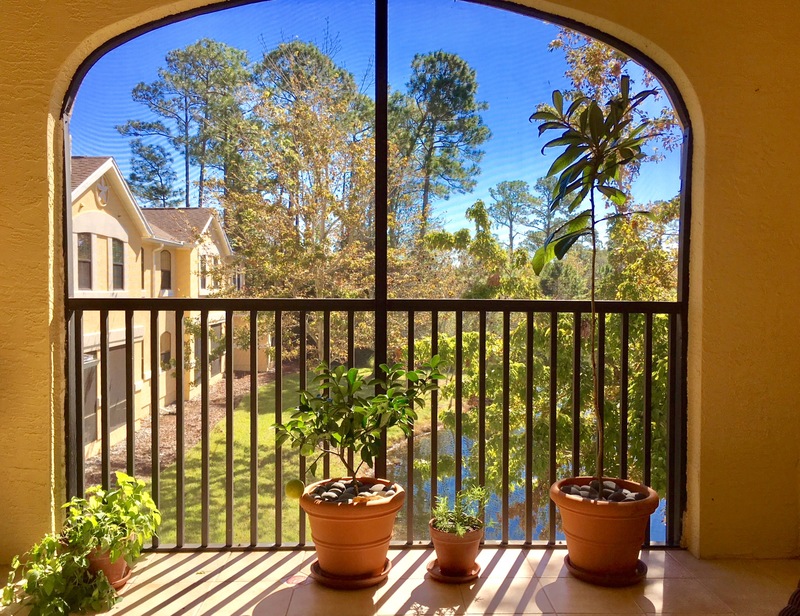 We enjoy Tallahassee for its very definite change in seasons. Our two and a half weeks of winter suit us quite nicely! Two and a half weeks is nuttin’! It is all perspective, isn’t it? Today was 53F and I thought it was a great day. I’m not a fan of heat and anything north of 80F doesn’t make me happy. It doesn’t sound like you have a great month ahead of you. 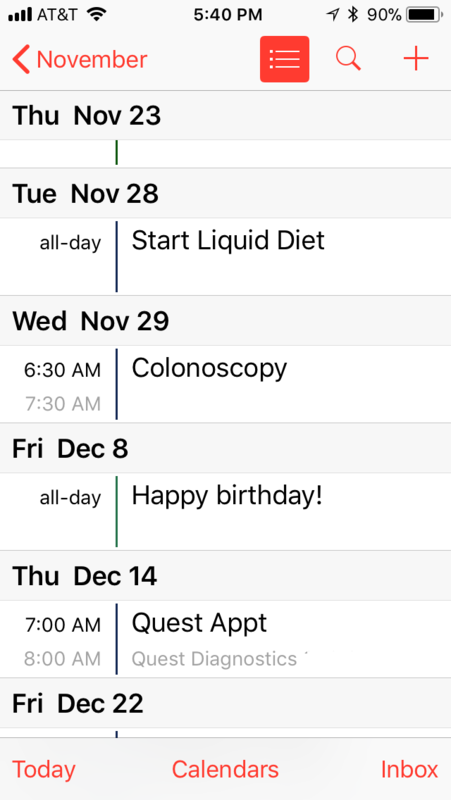 Personally, I think the worst part of the colonoscopy is the fasting beforehand. Hopefully all goes well and problem free … then you will have a very happy birthday. Oh – and the kidney stones. Ouch – you have my deepest sympathy! This will be my second colonoscopy, and I agree with you completely that it’s the liquid diet 24 hours ahead of it. Jello is not a food source, please! But somehow I’ll get through it… as I will these stones. Thanks, Joanne! I am so jealous that you and Gorgeous live in St. Augustine. We visited there several years ago and I loved it, particularly everyone’s beautiful gardens. Hope your medical tests go well. I’ve never had a kidney stone, but a friend gets them and said passing it was worse than childbirth. Ouch. I am curious why they are not attempting to deal with both of your medical issues at the same time. Wouldn’t that be more efficient and cost the insurance company less money? Ah, yes, the differences between an HMO and FFS plan are sometimes painfully glaring. I’m afraid all the doctors are separate and work quite independently of one another. My gastroenterologist is here in St. Augustine, but the urologist is based in Jacksonville. The link between them is the general practitioner, but all he really wants is just a report from each after each procedure. *How* it actually gets done I suppose is beyond his attention span. We do wait for National Health Insurance to solve these dilemmas … but like peace in the Middle East that probably won’t come in my lifetime anyway.